I seem to be on a witch kick! Fantasy Cream was extended a week, and will be wrapping up soon. There is a little hunt, with each designer offering up a goodie, as well as exclusive designs set out from each merchant. The Pumpkin Latern is a hunt gift from Fantavatar & Moonstruck. The dress is a wonderful exclusive creation from BlueMoon Enterprise, and while it might not be free, it is so unique, I had to show it to you. if you peak inside of the dress, there is a whole scene, there is even a little moon! 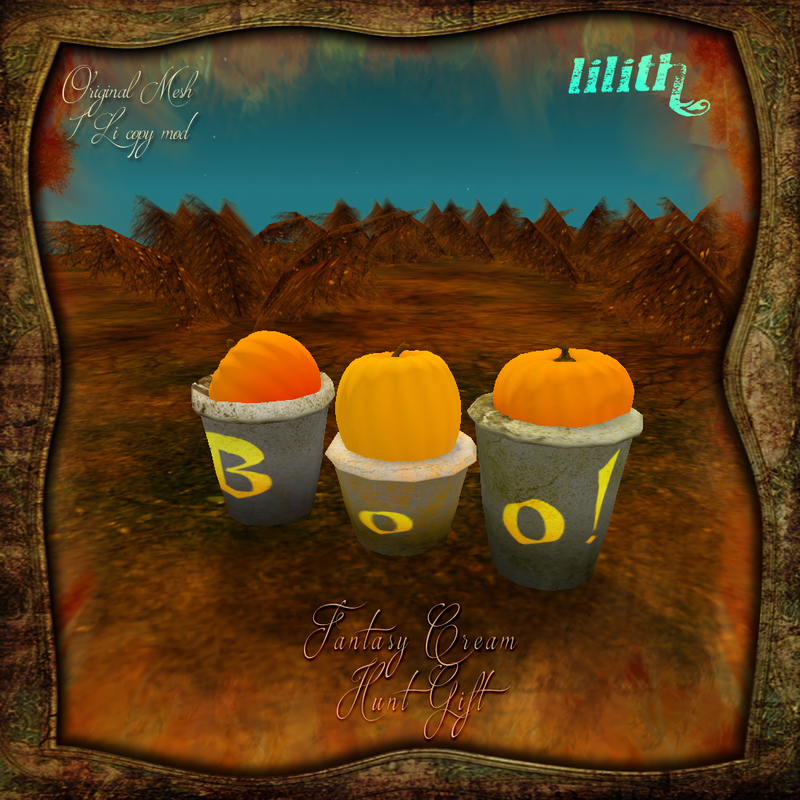 The Pumpkin Bench in the background is another exclusive, from Lilith's Den. They have a cute little gift in the hunt too, which is not show here, but I got the ad so you can see it. I figured since I was being all artsy, I would take a pic of my face, so you could see the other freebies a bit better. The Shedding Hair hunt by Adoness is still going strong, ending on the 31st of the month. 24 hairs in 12 combs to find. Modish decided to spoil us with a gift. It had been a while, but was well worth the wait. There are 2 skins in the group gift, I am wearing tone 5 here in this shot.